How sure are we that K.A.T. Fitness System - Disc 1 (DVD) will work for you? Simply fill out the form below and put K.A.T. Fitness System - Disc 1 (DVD) to work for you right now. Obviously, we would go out of business if K.A.T. Fitness System - Disc 1 (DVD) didn't work, the way we said, right? With the promise of a full refund if you're unsatisfied, you have nothing to lose by trying K.A.T. Fitness System - Disc 1 (DVD). Go ahead and try it today. playing hard is a way of life. To perform at your peak, you need to stay fit, strong, and agile. Conventional wisdom says that takes hard work. And it does. But what if the training you did to stay on your game was as fun and intriguing as the game itself? Now it can be. 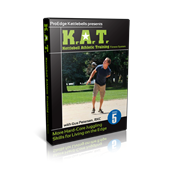 The Kettlebell Athletic Training (K.A.T.) Fitness System is an all-American mix of kettlebell juggling moves that's as physically demanding and mentally engaging as your chosen sport, athletic endeavor, or outdoor adventure. Whether you're a serious player, a weekend warrior, or an elite athlete, this innovative system provides a clear, step-by-step progression that will safely enable you to improve your athletic skills, functional strength, and cardiovascular endurance with a single, all-encompassing training system. 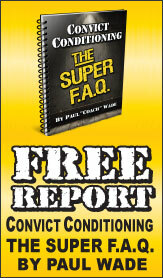 In Disc 1 you'll master the basic building blocks of the system. What's more, you'll get a workout that feels more like play than work. And yet delivers results with unbelievable efficiency. No wonder Gus is such a nice fellow, his workouts are tremendously motivating and refreshing. A few weeks ago I purchased this DVD, and when I went to my RKC last weekend I just had to buy parts 2 and 3. Plus I met Gus there, he gave a lot of support and useful tips, contact information, everything. I can see myself going at this system for years. That's how I feel after a 20-30min KB juggling workout, Like I had Fun. Now, I'm starting to notice the benefits. Quicker/Stronger Hands, Better Focus and Coordination and a bit more athletic :) WTH is wrong with that? I had the opportunity to meet Gus and his wife Karen (The one on the DVD who will out -juggle you any day) at Hardstyle Ventura in California Last Year. To say I was intrigued, an understatement. Gus is one of the most giving people of his time and knowledge. He spent plenty of time at the Workshop with me and he sent me his DVD's for my birthday after meeting him. The only real gift in return is for me to, Master This Gift and Spread it to others. My Promise to Gus. My Promise to You, If you pick up this DVD, you will become a better athlete simply by working through the basics. Add to that the fact that if you contact Gus, he Will make sure you are doing it correctly. He Video Coaches me across the United States. Not sure I know many like him and now that DVD#1 is broken in, time to attack DVD#2. Filipino Flips, eh? 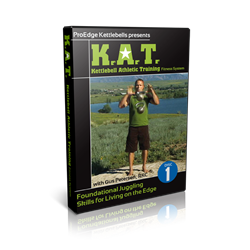 The Kettlebell Athletic Training (K.A.T.) Fitness System is amazing, Gus is a incredible man and he does with kettlebells some important to keep focus at all times on the workout, I had fun!!! This is a great DVD! It's definitely a challenge and the way the DVD sections are broken down the workouts are easy to follow. The tap drills are challenging and fun as well as the side swing. I haven't gotten to the others yet but definitely a good base should be developed before the others are attempted. This DVD is definitely for some one who's looking for something different than the traditional kettlebell workouts.